The 7th Edition of the World Karate Championships for karate athletes will start on Thursday 14th June. These Championships, which will be held in Dundee, Scotland are planned to end on the 18th June. Three athletes and 2 coaches will be representing SKSM. As always, SKSM Team will represent Malta with great Honour, and the Maltese Flag will once again be seen amongst 55 other countries from around the globe. All athletes from SKSM have been offered this opportunity and the 3 athletes taking part are Rowan Saliba, Andrea Saliba and Zack Pace Cauchi. Their categories are those of children and Mini-cadets respectively. All categories will be under the guidance of the two coaches Andrew Galea and Amber Camilleri. 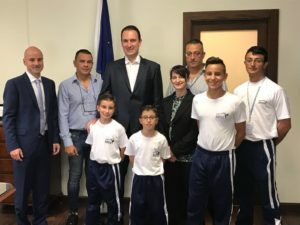 Athletes have been undergoing intensive training in these last few months in preparation for these Championships and have participated and represented Malta in various International Championships where they have made it to the podium for Gold more than once. The training programme for the 3 athletes at SKSM included specialized sessions in the physical and mental preparation including the technical aspects involved in Karate training. This programme was successfully achieved through great team work between SKSM coaches and Senseis. These Championships are the biggest Event organized by the World Union of Karate-Do Federations (WUKF) where the number of participating athletes is estimated to reach 2300 competitors from around the world. We wish SKSM Malta Team the best of luck! Once again, the Maltese Delegation will be headed by Mr Chris Galea.